Blog Posts | Inta-Great | Growing Individuals and Organizations to Their "Greatness." If you’ve been following along with me these past few months, then you know that together we’ve been exploring how you can discover your niche – your true purpose. To do so, I proposed that you consider three things: your strengths (things you are good at AND enjoy doing), your passions (topics, causes, people, etc. that you are deeply motivated and moved by), and finally, what other people will pay you to do. For example, a few years ago, I was working in a position that I was quite skilled at but that did not align with my strengths or passions. I was in a role that was more administrative in nature: overseeing event planning and registration, scheduling coaching and training sessions, and producing and putting together training workbooks. I performed so well in my role that I was promoted to Program Director and given a 20% raise. I even had a lovely office with a view of downtown Pittsburgh. Despite all this, it wasn’t enough. I wasn’t inspired. The work came too easily to me – I wasn’t challenged or passionate about what I was doing. I was bored. I felt myself longing for something more. I was longing for the chance to put my curriculum writing and facilitation strengths to use while investing in next generation leaders. So, I left my comfortable, well-paying, full-time job to pursue what I was passionate about – developing a leadership training program for middle school and high school girls, Blossom and Flourish. 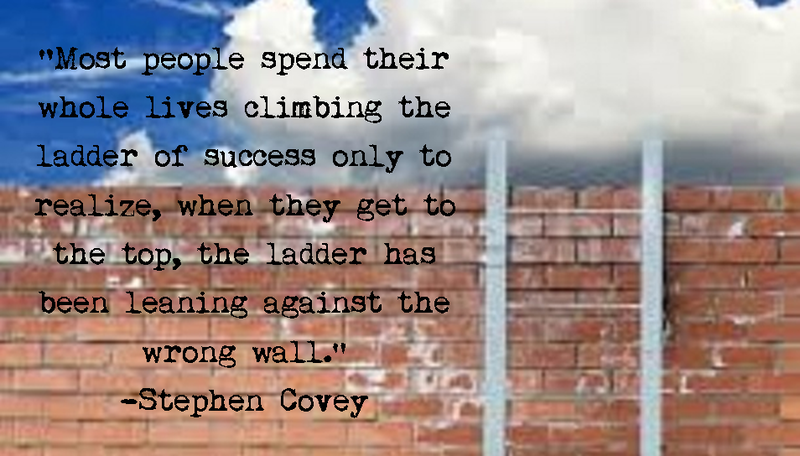 That choice represents the only solution to the problem of climbing the wrong ladder – choosing the right wall to climb in the first place! To do so, cultivate a deep sense of personal awareness around your strengths and passions before performing an examination of financially stable careers. Instead of looking at a list of well-paying careers and choosing one to prepare for, examine your strengths and passions, and then consider how you can create value for others out of that uniqueness. In what ways do your strengths and passions equip you to offer a valuable service or product to others? What types of fields would let you pursue that? It’s important to note that while you still might have to “pay your dues” in a few roles before you reach your “dream job,” at least you will have the satisfaction of knowing that you are working in the right field – you are climbing up the right wall. You also might have to be content with earning comparatively less than you would have in a different position or field. Less than ideal jobs or paychecks become bearable, however, if you know that they are preparing you for the next step along your life of purpose. If we revisit my example, I can tell you that when I left my full-time job to start Blossom and Flourish, it meant that my husband and I gave up a large chunk of our disposable income. I can also tell you that we don’t regret it. We found that we were both happier with a lower combined income and the knowledge that I was working out of my purpose, than we were when I was dissatisfied five days out of the week. Even if that meant we had to give up eating out at fancy restaurants every weekend and switching from cable to Netflix. 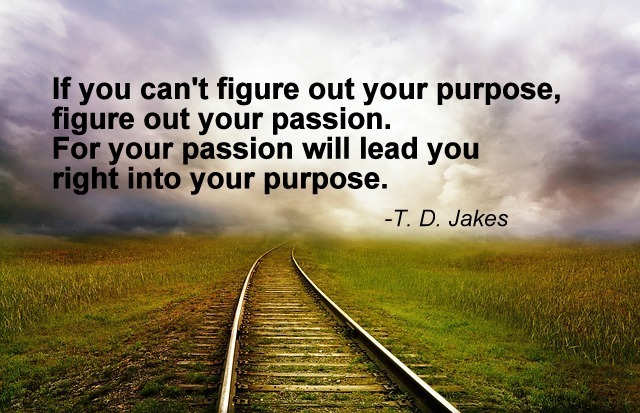 So, what are some practical ways you can identify a purposeful career path? After understanding your strengths and passions, do your research! Thanks to the internet, the world is at our fingertips. Go on job boards and see what types of jobs are available in different fields. Join local networking groups or organizations. If you are still in college, take advantage of your career services department and ask them to help you explore the possibilities. If you aren’t already on LinkedIn, join it. Search for companies, job openings, and individuals who work in jobs you are interested in. Then, when you meet someone who does something you’re interested in learning more about, connect with them. Message them, email them, or call them. Tell them they work in a field you are interested in and that you would love to know more about their career path and how they got to where they are today. Ask if they would be willing to meet with you and give you some advice as you pursue your career goals. In my experience, most people are impressed by that type of initiative and are flattered by such an invitation. Connecting with others like this does two things: a) it helps you learn more about a potential career path and b) it helps build your professional network. Last fall, Karen emailed me out of the blue. She introduced herself saying that she had recently graduated from college, had an internship at a small, girl-serving non-profit, and was hoping to pursue further work in that field. She said she found my email address through Blossom & Flourish’s listing on the Girls Coalition of Southwestern PA Member Directory, and asked if we could connect. She attached her resume and cover letter. I was so impressed with her resourcefulness that although Blossom & Flourish wasn’t currently hiring, I wanted to help her as much as I could. Long story short, we’ve met a few times now, and I’ve been able to: help her revamp her resume to better highlight her strengths, give her interviewing tips, suggest some good networking groups for her to join, and serve as a reference for her when she applied for a part-time position at another organization that I had previously worked with. She got the job. And that job has served to qualify her to apply for a new full-time position that has become available through that same organization. It all started with her initiative and a request to connect. What Karen did, anyone can do. You just have to know what your strengths are, what you’re passionate about, and do your homework. It may take time and effort, but I promise you, it will be worth it. Certainly earning a large paycheck is nice, but is it worth ending up in a job you don’t belong in? Too many people live for the weekend and dread Monday morning. They might be earning a lot, but at what cost? Dare to be different. Dare to discover your niche and chase after it. 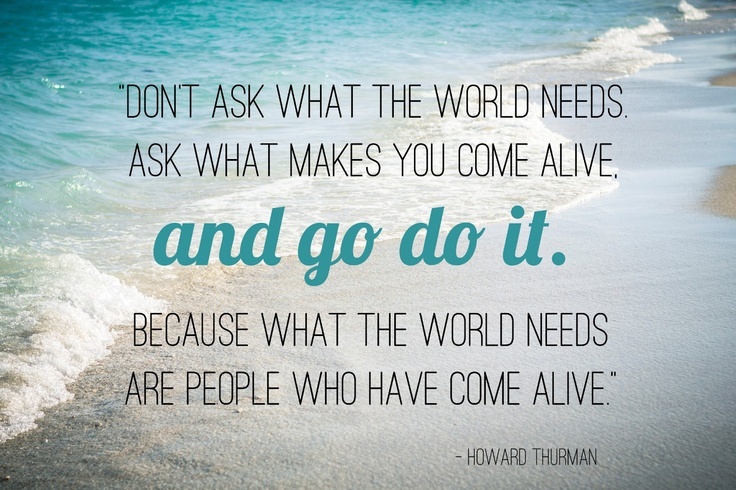 Dare to live your life on purpose. Last week, I wrote a post asking you to consider whether you were truly living your life on purpose. That post, the first of a new series, explored why so many of us are settling for jobs and careers where we find ourselves counting down the minutes until the weekend. I asked why so many of us are settling for a life we enjoy only 28.6% of the time – 2 out of 7 days of the week. The answer it seems is that many of us have sadly traded financial security for bold, daring, purposeful living. In contrast to this path of soulless security, I proposed a new path – one that would require creativity, innovation, and hard work but result in greater satisfaction and fulfillment. Taking this path does not require us to cast aside the practicality of having to earn a living, but instead positions financial security as only one of three considerations when choosing a career path. The other two areas to consider are your passions and your strengths, and where the three come together, that is your niche – your purpose. It’s only when we are functioning out of our niche that we truly come alive and unleash all of our creative potential. Today my question for you is, are you living a strong life? Do you know what it means to live out of your strengths? Do you even truly know what your strengths are? Unfortunately, too many of us are not great at understanding and articulating our strengths. Someone asks us what our strengths are, and we either offer a vague response or we list off a couple of things we’re good at. But have you ever talked with someone who truly seemed to be working out of their niche? Someone who seems to be living an intentional life of purpose? If you ask people like that what their strengths are, their answers are different. They’re articulate, precise, and confident. How then can you develop better answers to the question, “What are your strengths?” The first thing to do is cultivate a correct understanding of what a strength really is. Too often, we think a strength is only something we are good at. That’s not really true though, is it? I’m confident that there is something you are good at, but you hate doing. For me, I’m excellent at math. Not to brag, but I’m pretty sure the lowest grade I ever got in any math class throughout my college career was a 97%. And yet, I never considered a job in finance, accounting, or as a math teacher. Why? Math didn’t inspire me. I might have been good at it, but to me, it was boring and tedious work. A strength is not just something we’re good at then. That’s only part of the equation.A strength is something that we are good at and we enjoy doing. It’s something that leaves us feeling energized and fulfilled after we’ve been doing it – even though we might feel physically tired. And often, when we are working out of an area of strength, we “get in the zone.” Minutes and then hours just seem to fly by. There are times I’ll get inspired and start designing new curriculum or planning for a keynote around 9pm, and the next thing I know it’s 3am! My body then reminds me that I’m tired, and I need to go to bed, but overall I have a sense of excitement and fulfillment. That’s how you know something is a strength. With this in mind, I’d like to offer you a few ways to start identifying your strengths. First, there are some great resources available like StrengthsFinder 2.0 that offer you an online strengths assessment. While a powerful tool, especially if you feel completely stuck when it comes to thinking about your strengths, it’s not enough. A strengths report is a great starting point, but it doesn’t help you clearly see how those strengths are lived out in your daily life. The next two approaches to identifying your strengths are much more personalized and require you to set aside time to intentionally consider and reflect on your experiences and abilities. While similar, one is focused on the here and now while the other focuses on your personal history. In regard to considering your strengths in the here and now, strengths expert Marcus Buckingham suggests carrying around a small “strengths notebook” with you for a week a two. Every time you find yourself doing something that you enjoy, feeling as though you are performing quite well, or experiencing a sense of satisfaction from a job well done, write it down. Then, at the end of that week or two, make time to review your journal and examine what you wrote down. Are there any common themes? Do you see any patterns emerging? Those are your strengths. There’s also great insight to be gained from reflecting on your past. Research has shown that although we mature and our values and beliefs may change, the core of who we are tends to stay consistent over time. If you loved competition as a child, you’re still going to be competitive as an adult. When I was in sixth grade, there were two fourth grade girls on my softball team. I loved encouraging them and helping them learn new softball skills. I also remember talking to them and giving them advice about fourth grade, and more importantly on what it would be like when they got to fifth grade and had to change classrooms and teachers twice a day for the first time. I still love mentoring and investing in others. So, grab a piece of blank paper, turn it side-ways, and draw a time-line across the bottom (five year increments usually work best). Then, start filling it in. What things were you good at growing up? What did you enjoy doing as a kid? What are your most energizing memories? Think back as far as you can. What did you love doing in kindergarten? Elementary school? Middle school? High school? College? When you’re done, once again look over everything you came up with – are there any common themes? Are any patterns emerging? Your timeline is the story of your strengths played out throughout your life. Now, there are a few of important things I want you to keep in mind while you complete either the notebook or timeline activity. First, suspend judgment. Don’t over think it! You’ll get to analyze the data later. When you are first writing things down either in the moment or that you remember, don’t edit yourself. Just acknowledge it as a moment where you felt strong and fulfilled. Then, at the end, go back and look over what you wrote down with a more analytical eye. The second thing is write down whatever comes to mind. Don’t discount anything; nothing is too small. One of my earliest strength memories is coloring inside the lines with my grandma. While seemingly insignificant at first glance, when you look at my whole timeline, you’ll see that it’s the start of a pattern of striving for excellence and spending one-on-one quality time with the people I care about. Third, consider experiences from all areas of your life not just work. Don’t limit yourself to experiences in a professional setting. Our strengths are not just evident at work. They are a part of who we are, so they come out in all areas of our lives – our relationships and experiences with our family and friends, school experiences, hobbies, house projects, volunteer work, etc. Like I mentioned earlier, I was naturally mentoring my teammates and friends long before I knew what “mentoring” was. Finally, consider sharing your results with some you trust and who knows you well. Perhaps that’s a spouse, friend, mentor, colleague, parent, or executive coach. Sometimes we are blind to our own uniqueness. Sometimes a strength comes so naturally to us that we don’t recognize how special it is. That’s why getting an outside perspective from a trusted source can be helpful. Overall, while this process is fairly simple, it can provide tremendous insight. Just like most things in life, however, you get out what you put into it. So grab a notebook and a pen and make it a point to pause throughout your day. Then set some time aside one evening or weekend to work on your timeline. Reflect, reminisce, review. Recognize what it is that you do well and leaves you feeling fulfilled. Realize your strengths. Put them to work. Live a strong life. Deep down inside, I believe all of us want to be significant. We want to make some sort of a difference. We want our lives to mean something and leave our mark on the world. We want to wake up and feel excited about our day. Work hard at a job we’re passionate about and create an impact. So why then, do so many of us wake up filled with dread about going to work, do the bare minimum we need to in order to get by, and become complacent with mediocrity? Somewhere along the line we trade our optimism for cynicism and our dreams for security. Why? I’m not saying that security in and of itself is a bad thing – paying the bills is important. But is it enough? Is pursuing security worth ending up in a job where you countdown the minutes of every day and live for the weekend? Is it worth enjoying only 2 out of the 7 days of the week? Think about it. 2 out of 7 equals 28.6%. Whose goal is it to enjoy life only 28.6% of the time? At my job, I’ve had the pleasure of meeting and working with many young, bright, intelligent high school and college students. Despite their many difference, most all of them are wrestling with the same questions – What do I want to do with my life? What do I want to be when I “grow up?” Very rarely do I hear them say, “Work at a job I can’t stand because it pays the bills.” No, that mindset creeps in slowly from the outside and usually from people who mean well. Look, I’m not an idealist; I know we all need to make money to support ourselves. But shouldn’t making money be only one of the criteria by which we choose a career path instead of the only criteria? When thinking about a career, I usually tell people to consider three things: what they are passionate about, their strengths, and what other people will pay them to do. Where the three come together – that’s your niche. Your niche reflects your purpose. It’s where you can create your unique impact on the world. Will it be easy? Probably not. Will it take hard work and dedication? Yes. Will it require us to think outside of the box? Most likely. But the good news is that when we are working out of our strengths and in areas we are passionate about – we don’t mind working hard. We’re not staring at the clock counting down the minutes until 5pm. Instead we get caught up in the complexities, challenges, and opportunities in front of us. We unleash our creativity and innovation. We come alive. No, it’s not a guarantee that life will be perfect, and there will still be days that you may feel tired or frustrated. In the midst of those times, however, you can be assured of one thing – the hard times are worth it. There might be bumps along the road, but the destination – having lived a life of purpose – is worth enduring them. You will find rest in the satisfaction of knowing that come the end of your life, you won’t have to look back and say “I wish I would have…” or “Why didn’t I try…?” Instead, you’ll know that you gave it your all. 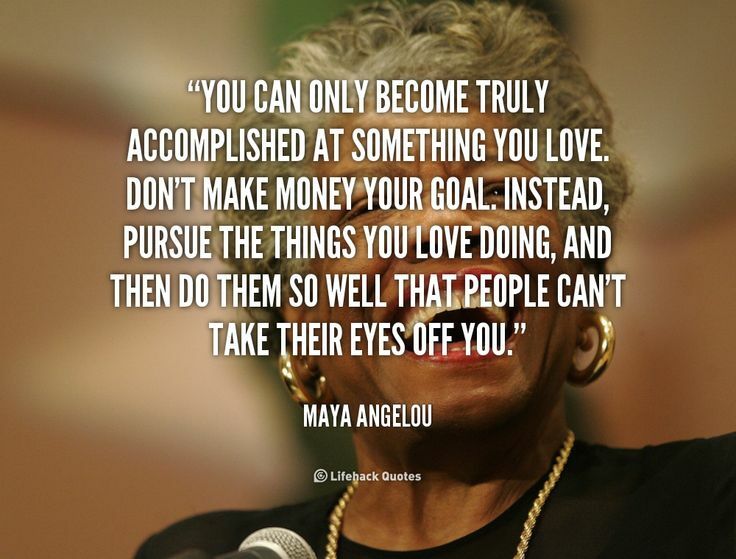 You lived your life with intention and made your mark. At this point, you might be thinking, “That all sounds well and good, but I don’t even know what my strengths are.” Or “I’m not sure what I’m passionate about.” Or, “But you don’t understand, I could never make enough money doing what I want to do.” If that’s you, then join me over the next few weeks as we explore those types of questions together. Join me as we explore how you can be intentional about living your life on purpose. Values are so important because they are a part of the organization’s core ideology—the “central identity or character” of the organization (p. 334). While many aspects of the organization are often changing and growing, the values should remain the same and serve as an ethical compass for the organization by guiding employee behavior. As leaders, we set the tone for our employee’s behavior. “Leaders are the ethics officers of their organizations, casting light or shadow in large part through the example they set” (Johnson, 2012, p. 318). Essentially, leaders need to serve as ethical role models to their followers by embodying the organizational values through word and deed. In contrast, leaders should embody the organizational values in such a way that by following in their example, their employees should also act with the organization’s values in mind. Successful implementation of ethical values means employees “learn to govern their own behavior by following these same principles” (Johnson, 2012, p. 329). While walking the talk in this way is incredibly important, it is surprisingly not enough in this instance. Leaders must also talk the talk. Words without action may be meaningless, but action without words can easily be overlooked in the busy, sometimes hectic, marketplace. Therefore, as the ethics officers for their organizations, leaders must continually communicate the organization’s values to their employees. This involves: (a) discussing the values with one’s team so everyone is clear on what they are and what they mean; (b) highlighting how new initiatives and goals reflect the organization’s values; (c) linking performance reviews to the values; and (d) mentioning them in everyday conversations. For example, if one your organizational values is “innovation,” you could introduce the implementation of a new sales software system as such, “As part of our dedication to thinking outside the box and trying new things to propel us forward, we will be implementing a new software system to help us keep track of our sales records. As we implement the program, please let us know what works, what is challenging, and any solutions or ideas you have for even better application and implementation.” Doing so explains the decision to use the new software in light of the organization’s value around innovation and also invites the employees to engage in innovation by suggesting new and better ways to use the program. Overall, what is most important to note is that communicating the values cannot be once and done. They cannot be mentioned one time and then be hung on the wall to die. Instead, communication must be on-going. Employees need to be reminded of the importance of organizational values and their ethical responsibilities through the leader’s words and actions on a consistent basis.